The croissant is a crescent-shaped pastry made from laminated dough. Laminated, or layered, dough is a process that creates layers of butter in between layers of dough. The buttery pastry makes for a high-calorie and high-fat breakfast or treat. Many bakeries feature a chocolate croissant, which contains even more calories and fat than a traditional croissant. The calories in a chocolate croissant vary depending on the baker. One chocolate croissant from Trader Joe's contains 320 calories. One chocolate croissant from Starbucks contains 300 calories. And one from Au Bon Pain contains 420 calories. 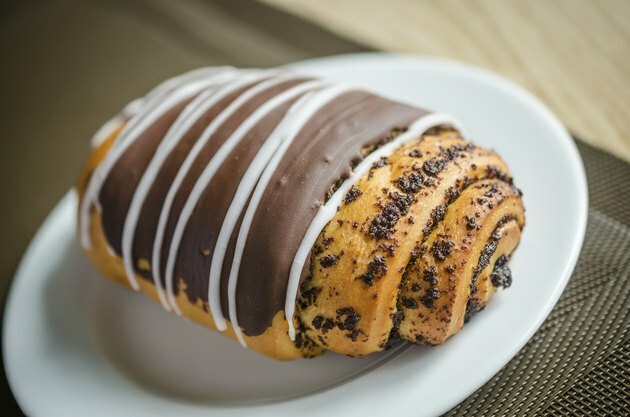 The chocolate croissant from Au Bon Pain is larger, at about 106 g, than the one from Starbucks, at about 80 g.
As a butter-layered pastry, the chocolate croissant is high in total fat and saturated fat. One Trader Joe's chocolate croissant contains 18 g of total fat and 11 g of saturated fat. A serving of Starbucks chocolate croissant contains 17 g of total fat and 10 g of saturated fat. One Au Bon Pain chocolate croissant contains 22 g of total fat and 13 g of saturated fat. The American Heart Association recommends you limit your saturated fat intake to less than 20 percent of your total calorie intake. If you follow a 2,000-calorie diet, that means no more than 15.5 g of saturated fat day. One chocolate croissant meets nearly a day's worth of saturated fat. One Trader Joe's chocolate croissant contains 34 g of carbohydrates, 1 g of fiber and 5 g of protein. One Starbucks chocolate croissant contains 34 g of carbohydrates, 2 g of fiber and 5 g of protein. One serving of Au Bon Pain chocolate croissant contains 58 g of carbohydrate, 3 g of fiber and 7 g of protein. For the calories, a croissant is not a significant source of fiber. One medium apple has about 100 calories and 4.4 g of fiber. Healthy women need 21 to 25 g of fiber a day and healthy men need 30 to 38 g of fiber a day. One Trader Joe's chocolate croissant contains 270 mg of sodium. One Starbucks chocolate croissant contains 220 mg of sodium. One Au Bon Pain chocolate croissant contains 210 mg of sodium. The U.S. Department of Agriculture's dietary guidelines for Americans recommends you limit your daily sodium intake to less than 2,300 mg a day. One chocolate croissant meets about 10 percent of your daily sodium needs.